CarboSchools links researchers from several leading carbon science laboratories in Europe with secondary schools. In these partnerships, young Europeans conduct experiments on the impact of greenhouse gases and learn about climate research and the reduction of emissions. Scientists and teachers co-operate over several months to give young people practical experience of research through true investigations and interactions with real scientists. The pupils also have the opportunity to inform the wider community about climate change by producing a final output of articles, exhibitions, conferences etc. Nine research institutes in seven countries are exploring how they can best motivate and support such partnerships at the regional level across a wide variety of contexts, topics and age-groups. European co-operation makes it possible to compare results, learn from each other and develop replicable good practice. Pupils can gain European experience by getting involved in the Europe-wide "schoolCO2web" project. In order to assess the educational impact of the CarboSchools project, an in-depth evaluation of attitudes, beliefs and skills will be carried out. Started in 2004 by CarboEurope and CARBOOCEAN, two major research projects on the carbon cycle, CarboSchools is currently funded until 2010 by the Science in Society programme of the EU with a target of ca. 100 schools directly involved. Furthermore, in 2008-2011, EPOCA, a new EU research project on ocean acidification, is also joining forces with CarboSchools. We hope that students will become fascinated and empowered by searching for solutions to "the biggest uncontrolled scientific experiment in human history" and that they will experience a true European dimension. We hope to make science learning more engaging and challenging for young people as future workers, consumers and citizens. One of the research topics of the Climate Research Laboratory in Science Park in Barcelona (LRC-PCB; http://www.lrclima.net/) is carbon dynamics, going from the local to the global scale, passing by the regional one (NE Iberian Peninsula). Precise and accurate atmospheric CO2 measurements are obtained in ground remote sites, in tall towers and in airborne platforms. LRC-PCB has also the objective of approaching its research to the society. The education goal of Climate Research Laboratory is to become an International Open Center for educational purposes on Climate Research and Global Change on both formal and non-formal education. In CarboSchools+, LRC-PCB (www.carboschools.cat) is closely working with Fundació Escoles Tr@ms, an association of schools concerned with science teaching in their classes, trying to implement Carbon Cycle and Global Change disciplines in their science curricula. A site of CO2-Schoolweb European network is going to be established as a focal point to meet scientist, teachers and students together. Moreover, the Natural Sciences Section of the Mataró Museum (http://www.scn-mm.cat/) is going to hold another CO2 measurement site. It is going to be a focal point of non-formal discussions about the Global Change issues, always with the concurrence of scientist involved in this research field. 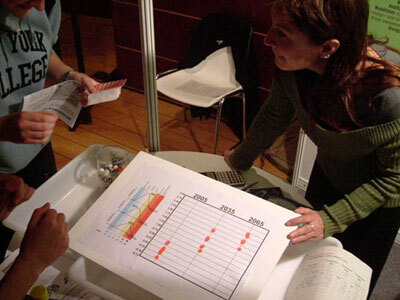 An exhibition about the CarboSchools+ project and the Science of Carbon Cycle and Global Change will provide a context for the CO2 measurements obtained in the Mataró city center. LRC-PCB is looking for collaboration with more teachers and schools, and it is having success. By now, teachers associated with the “Seminari Permanent de Ciències Naturals”, some of them participants in the last EGU GIFT meeting in Vienna, are interested in CS+. Currently, LRC-PCB meets them to develop activities where scientist-teachers-students learn to make science together! In 2004, scientists of the Centre for Isotope Research (CIO) and the Department of Education (IDO) of University of Groningen started a cooperation with teachers from three secondary schools to build a SchoolCO2web. 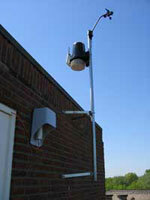 This is a network of schools with equipment on their roofs to measure atmospheric CO2 and weather variables. All the data are available online for pupils and teachers to use within their projects. In Groningen, we have a network of teachers who regularly come together on the university to design new student projects for the science subjects in cooperation with scientists. Within this network we formed a group of people who work on the schoolCO2web and the carbon cycle. 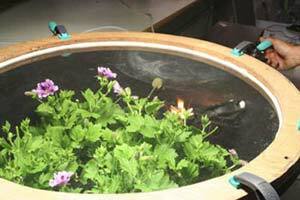 Last year they worked on a module for a new science subject: Nature, Life and Technology. Moreover, they came up with different ideas for “profile projects”. These are projects for the higher grades in which pupils design and carry out their own research. 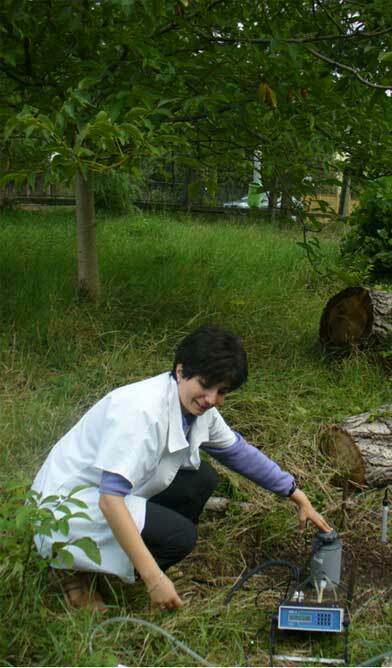 The teachers aim to guide pupils towards projects focused on atmospheric measurements, plant respiration in a closed box and the carbon footprint. Pupils have the possibilities to do a part of their project on the university. Within the CarboSchools project, we will cooperate with our project partners in order to expand the SchoolCO2web to a European scale. We believe that the enrichment of this network will not only create a valuable resource for student projects and even scientific research. It is also a way to create a community in which European pupils, teachers and scientists will cooperate together on expanding knowledge on climate change. Another important goal in CarboSchools is to evaluate how pupils experience working on projects about climate science. Does their attitude towards climate change and science change after doing these projects? To answer these questions, evaluation tools are developped by the Departemnent of Education to investigate the impact of our efforts. The CarboSchools projects in the UK (primarily but not exclusively in Norwich) will be organised in the style of traditional TSN partnerships. TSN is a local science education charity that has partnered teachers with scientists since 1994 offering support to those teachers who don’t feel confident in particular topics or those who want to update their own scientific knowledge or enrich the learning experience of their pupils, showing scientists to be real everyday people and challenging the negative images of science and scientists (website). In the context of CarboSchools, we will use all our experience to facilitate links between local secondary schools and local carbon scientists (from the highly regarded University of East Anglia’s School of Environmental Science (UEA), website of UEA) so that the projects they undertake have Carbon science at their core. They will be planned jointly by teacher and scientist. TSN will also be contributing partner schools to SchoolCO2web. More details of all these projects can be found at this link. Should you be based in the UK and wish to take part please contact Dr. Phil Smith, TSN Coordinator (phil.smithALTbbsrc.ac.uk). 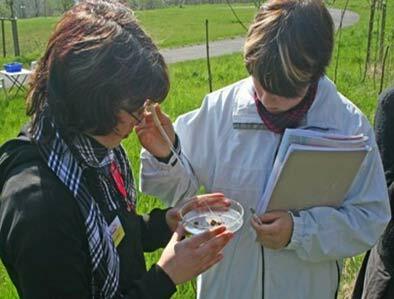 In the Aquitaine region, partnerships are formed between secondary school teachers and scientists from the leading research laboratories: INRA (National Research Institute for Agronomy) and CNRS (National Scientifc Research Centre) and Bordeaux University-1 based near Bordeaux. The research unit EPHYSE (INRA), carries out research on continental ecosystems such as agricultural systems or forests, while EPOC (CNRS and Bordeaux University-1), conducts fundamental international research in the domains of littoral oceanography, palaeoclimatology, and environments of the continent-ocean interface. The Aquitaine project started in 2006 with a group of 15 pupils from the Max Linder School in Libourne. 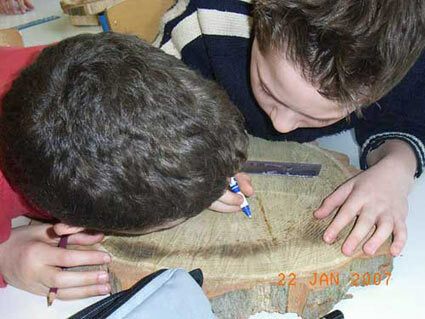 In 2010, 430 pupils from 14 schools take part in a CarboSchools project. Most of the projects are integrated into the school curriculum over a school year and are inter-disciplinary. In order to study the carbon cycle, the greenhouse effect and climat change, the pupils attend interactive lectures given by the scientists and they visit the EPHYSE and EPOC research laboratories. 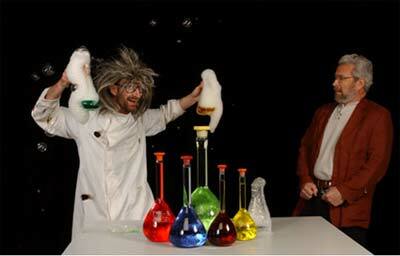 They then go on to think up and carry out experiments with the guidance of their teacher/s and a scientist. At the end of the school year the pupils are invited to present their work and findings in front of the other participating schools. Visit our regional website to find out more about these projects (in French). We are also participating in the SchoolCO2web project. Visit the SchoolCO2web page to compare CO2 emissions and climate at Max Linder school in Libourne with other schools in Europe. In the area near Paris the laboratory working with CarboSchools+ is the LSCE (Laboratoire des Sciences du Climat et de l’Environnement). It is a part of the IPSL (Institut Pierre Simon Laplace), a network of 6 laboratories in "Île-de-France Region" working within environmental science. Thanks to IPSL, researches of all topics about Climate may co-operate (ocean, biosphere, biodiversity, modelling…). 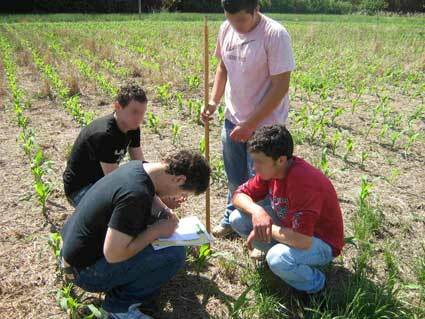 The LSCE manages Carboschools projects with secondary schools since the school year 2006-2007. Every year, pupils from 11 to 16 work on carbon cycle for periods ranging from one month to all year long, a dozen of researchers participates by punctual actions, some classes visit the laboratory for 2 or 3 hours. At the end of the scholar year, students present their results in front of their colleagues and a jury. At this point of the project more than 800 students have worked with the LSCE. Teachers, pupils, parents, if you are interested in a cooperation or would like to know more about our activities please consult our website (in French)! The scientists at the Max Planck Institute for Biogeochemistry (MPI-BGC) investigate global biogeochemical cycles and their interaction with the climate system. The institute combines strong observational and process-based studies (soil carbon, plant community structure, nutrition and growth, vegetation-atmosphere fluxes, convective boundary layer) with global scale modelling (e.g. vegetation dynamics, global carbon cycle, aerosol modelling). Under the framework of the CarboSchools project we are beginning to establish links with regional schools to offer students practical insights into earth system and climate change research. MPI-BGC will be partner in the schoolCO2web. If you are interested in a cooperation or would like to know more about our activities please consult our webpage. Since 2003, scientists of the Leibniz Institute of Marine Sciences at the University of Kiel (IFM-GEOMAR) and teachers from 10 secondary schools in Kiel and surroundings have been cooperating in the project NaT-Working "Marine Research" (http://nat-meer.geomar.de). To foster interest in sciences, school students at pre-university level are given the opportunity to work together with scientists on specific aspects of ocean research. The topics span the whole range of the institute's activities. 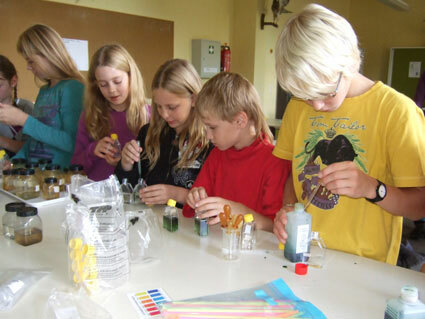 The CarboSchools project in Kiel adds a new component to this existing framework: the concept of climate change and its impact on the ocean are introduced to students between 10 and 14 years using experiments developed jointly by teachers and project scientists. "Sustainable conservation agriculture as a tool to mitigate greenhouse effect"
Benevento province is a mid-southern hilly-mountain area. Agriculture is the main activity, with a big number of little family-farms that cultivate a high percentage of the area. For centuries, traditional agriculture has been contributing to the management of this articulated territory. Modern "intensive" agriculture, on the contrary, has exposed in the last decades the agrarian soils to a real over-use, with the consequence of problems of erosion, landslides and strong organic matter losses. IbiMet-CNR works in this area since 2003, with several research projects dealing with calibration of action models for sustainable rural development. In this frame, sustainable agriculture techniques have been studied and developed all over the territory. Modern intensive agriculture can strongly contribute to increase CO2 emissions. Emissions are originated directly and indirectly by agriculture and quite always these emissions are higher than the CO2 taken up by the photosyntesis. Tractors burn gasoil and fertilizers are produced using petrol, and this contributes to direct emissions of CO2, expecially when people uses to plough deeply the soils and uses big quantities of fertilizers. Soil Organic Matter (S.O.M.) is an important element of the fertility. It contributes to the soil structure, provides minerals and conserves humidity. S.O.M. is composed by plant rests (leaves, rooths, parts of the harvest...); it results from the photosyntesis, so it is composed mainly by carbon. Before of the modern agriculture, at the beginning of the 20th century, agrarian soils were composed for more than 5-7% by Organic Matter. Modern intensive agriculture, expecially in marginal conditions (slopes, mountains, heavy soils...), has determined a huge oxydation of this soil O.M., with the result of big emissions of CO2 (millions of tons/year in the world) (still in progress) and the consequence of strong reduction in soil fertility. Conservation agriculture, reducing energy inputs, can contribute to reduce agrarian CO2 emissions directly (less gasoil and fertilizers use) and indirectly (supporting the strorage of CO2 in the soils in the form of O.M.). Sod Seeding (S.S.) is a conservative way to cultivate cereals and erbaceous corps. It’s widely used in south America (from more than 20 years) and, from few time, in some regions of Europe too. SodSeeding, also named Direct Seeding or No tillage is a technique that doesn’t need any kind of preparing soil tillages. It’s carried out with a special machine that, with a special system of disks, opens on closes in the soils thin furrows in which seeds go placed. It can be used on soils just after the cereal harvest, directly on grasslands or on “set aside” soils. Literature data show that this thecnique, if applied in a sustainable way, can sobstitute traditional modern agriculture, with good productions (comparable to the traditional ones) and interesting soil fetility betterments in the years. Together with a rational and/or dedicated management of cultivation residues, actually, SodSeeding system can contribute to increase soil O.M. content, with good results in terms of soil structure and mineral composition. Erosion and landslides risks (expecially in slope agriculture) can result reduced such as CO2 emissions. Avoiding soil tillages, actually, this technique reduces soil O.M. oxydation (that’s the cause of strong CO2 emissions) and contributes its storage in the soils. This way, agrarian soils have the potentiality to change from CO2 “sources” to CO2 “sinks”, also in consideration of the low energy inputs used for the whole production cycle. And this can also have considerable large-scale effects, considernig the huge world agrarian surfaces. If (theoretically) the 186 million Ha of the USA agrarian land would be put under SodSeeding technique, 4.3 mln of tons of CO2 emission would be avoided every year (Frye, 1984). Moreover SodSeeding tecnique is suitable for farmers because improves production efficiency, reduces times and, in the long period, also the need in fertilizers. The starting point of CS+ planned activity is that SodSeeding technique (but in general conservation agriculture) can contribute to mitigate greenhouse effect getting positive or more positive the overall CO2 cultivation balance. This looks like a good way to reduce environmental CO2 emissions and also to remove from atmosphere, in the long-period, interesting quantity of CO2. These elements have been considered interesting for the students of two Benevento’s vocational secondary schools: IPSAA “Vetrone” (vocational school for agriculture) and IIS “Alberti” (vocational school for chemistry and environment). Experimental fields have been prepared in IPSAA’s farm to analyse the effect of the Sod Seeding technique in comparison with the traditional agricultural techniques and to estimate the potential for greenhouse effect mitigation. IPSAA’s students are involved in agrarian aspects studies (crops growth, soil fertlity, weeds...) and, on the other hand, IIS’s students are involved in instrumental analysis about soil gas exchange, with specia attention to CO2. Different proofs will be prepared to show to the students how science can contribute directly to concrete things (i.e. agriculture) and how a simple way of making agriculture can contribute to mitigate greenhouse effect and to develop farms and territory. The Norwegian branch of CarboSchools is mainly concerned about marine topics, like chemical, physical, and to a certain extent biological oceanography, and our field area is the numerous fjords in the vicinity of Bergen. 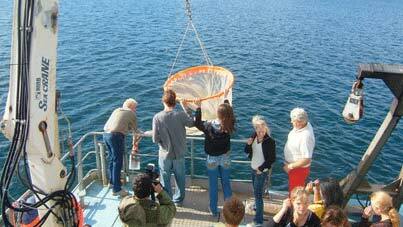 In 2006 scientists from the Bjerknes Centre for Climate Research and the Geophysical Institute at University of Bergen started collaboration with students (16-19 years old) and teachers from Bergen Katedralskole, and over the years the students/teachers have participated on several one-day cruises during Spring and Fall. Two additional schools; Bjørgvin videregående skole and Danielsen videregående skole, joined the collaboration in 2008, and others are welcome. So; how and why do temperature, oxygen, and inorganic carbon vary throughout the water column, which plankton species are abundant in the areas at different times, which species are living at the bottom of a shallow fjord compared to a deep fjord, are the fjords sink or source areas for atmospheric carbon dioxide, and how does ocean acidification affect marine life? These questions require hypothesis, data sampling, careful laboratory analysis, data processing, writing reports, and presenting the results – and this is similar to how the scientists work. So by being involved in this collaboration the students not only learn about marine chemistry/ physics/biology in relation to climate change, they also learn the scientific way of thinking and working. Additional aspects of these cruises are of course the pre-phase of planning and preparing, in addition to safety and instruments on board the research vessel. In our local webpage you can find more information about the project in Norwegian. The Group of Application of Stable Isotopes (GASI) is part of Mass Spectrometry, Chromatography and Applied Physics Department from National Institute for Research and Development of Isotopic and Molecular Technologies, Cluj Napoca, Romania (http://www.itim-cj.ro). The current research topics in our group, such as: environmental studies using stable isotopes, global carbon cycle, dynamic exchanges of the CO2 between biosphere and atmosphere, role of the terrestrial ecosystems in the global carbon cycle and the role of the terrestrial ecosystems as carbon source/sink, stable isotopes at the ecosystem level, identify and quantify the sources of atmospheric trace gases (CO2, CH4, N2O), stable isotopes as indicators of the environmental pollution, fit very well with the Carboschools+ concepts and ideas. The scientific knowledge, the international experience of the team members, the important teaching expertise, and the large proportion of women in the team are our strong reasons to join the Carboschools+ projects. It is our interest to initiate this type of activity in Romania and to promote science outside the scientific environment through direct exchange with students and teachers based on human contact. At this moment our team has already established contacts with two schools: National College “Emil Racovita” in Cluj-Napoca and the Secondary School in Somesul Rece (Cluj district). Recent discussions with teachers from the National College “David Prodan” in Cugir, Alba district, have shown their real interest to join these common projects. Both pupils and teachers are very interested in starting new activities related to climate change, as expressed during their visits in our group/institute last year. The receptivity and interest of the younger pupils (age of 12-18) is especially high and there will be a great challenge for us and, in the same time, a strong motivation to find the right tools/methods to communicate our scientific issues at their level of understanding. There is a mutual interest for both, pupils and teachers on one hand, and scientists, on the other hand, to establish a direct contact and to start activities from which we all will have a lot to learn. It is important to notice that we have given assistance to High School Emil Racovita in Cluj Napoca to elaborate and to submit a proposal to the Ministry of Education in Romania to ask for funding in order to implement new activities in their school related to environment and climate change. It is our interest not only to inform them about our real work, what a scientific career means or how important the climate change issue is, but to let them live this experience, let them know our daily activity. These young pupils might join later the institution as university students (in performing their Licence/Master Diploma) and/or start a scientific career in our institute. It is important to add that during the last two decades, every year several students from the Faculty of Physics (Babes-Bolyai University, Cluj-Napoca) have done their diploma thesis under the direct supervision of our group leader. Coordinated by the University of Education Heidelberg under the title “Teacher-Scientist Partnerships (TSP)- a tool for professional development”, this Comenius project investigates more in depth the pedagogical patterns of partnership projects and develop on this basis a series of teacher training modules to respond to the training needs that teachers face when joining such projects. Among the main immediate users of these modules will be the regional CarboSchools+ projects. The modules will be delivered in the autumn of 2009 (at the end of the TSP project).